HERE WAS IN the land of Judah a wicked king-named Jehoiakim, son of the good Josiah. While Jehoiakim was ruling over the land of Judah, Nebuchadnezzar, a great conqueror of the nations, came from Babylon with his army of Chaldean soldiers. He took the city of Jerusalem, and made Jehoiakim promise to submit to him as his master. And when he went back to his own land he took with him all the gold and silver that he could find in the Temple; and he carried away as captives very many of the princes and nobles, the best people in the land of Judah. When these Jews were brought to the land of Chaldea or Babylon, King Nebuchadnezzar gave orders to the prince, who had charge of his palace, to choose among these Jewish captives some young men who were of noble rank, and beautiful in their looks, and also quick and bright in their minds; young men who would be able to learn readily. These young men were to be placed under the care of wise men, who should teach them all that they knew, and fit them to stand before the king of Babylon, so that they might be his helpers to carry out his orders; and the king wished them to be wise, so that they might give him advice in ruling his people. Among the young men thus chosen were four Jews, men who had been brought from Judah. By order of the king the names of these men were changed. One of them, named Daniel, was to be called Belteshazzer; the other three young men were called Shadrach, Meshach and Abednego. They were taught in all the knowledge of the Chaldeans; and after three years of training they were taken into the king's palace. King Nebuchadnezzar was pleased with them, more than with any others who stood before him. He found them wise and faithful in the work given to them, and able to rule over men under them. And these four men came to the highest places in the kingdom of the Chaldeans. At one time King Nebuchadnezzar caused a great image to be made, and to be covered with gold. This image he set up, as an idol to be worshipped, on the plain of Dura, near the city of Babylon. When it was finished, it stood upon its base or foundation almost a hundred feet high; so that upon the plain it could be seen far away. Then the king sent out a command for all the princes, and rulers, and nobles in the land, to come to a great gathering, when the image was to be set apart for worship. The great men of the kingdom came from far and near and stood around the image. Among them, by command of the king, were Daniel's three friends, the young Jews, Shadrach, Meshach, and Abednego. For some reason, Daniel himself was not there. He may have been busy with the work of the kingdom in some other place. At one moment in the service before the image, all the trumpets sounded, the drums were beaten, and music was made upon musical instruments of all kinds, as a signal for all the people to kneel down and worship the great golden image. But while the people were kneeling, there were three men who stood up, and would not bow down. These were the three young Jews, Shadrach, Meshach, and Abednego. They knelt down before the Lord God only. "O king, may you live for ever! You gave orders that when the music sounded, every one should bow down and worship the golden image; and that if any man did not worship, he should be thrown into a furnace of fire. There are some Jews, whom you have made rulers in the land, who have not done as you commanded. Their names are Shadrach, Meshach and Abednego. They do not serve your gods, nor worship the golden image that you have set up." "O Shadrach, Meshach, and Abednego, was it by purpose that you did not fall down and worship the image of gold? The music shall sound once more, and if you then will worship the image, it will be well. But if you will not, then you shall be thrown into the furnace of fire, to die." "O King Nebuchadnezzar, we are ready to answer you at once. The God whom we serve is able to save us from the fiery furnace, and we know that he will save us. But if it is God's will that we should die, even then you may understand, O king, that we will not serve your gods, nor worship the golden image." "Make a fire in the furnace hotter than ever it has been before, as hot as fire can be made; and throw these three men into it." Then the soldiers of the king's army seized the three young Jews, as they stood in their loose robes, with their turbans on their heads. They tied them with ropes, and dragged them to the mouth of the furnace, and threw them into the fire. The flames rushed from the opened door with such fury that they burned even to death the soldiers who were holding these men; and the men themselves fell down bound into the middle of the fiery furnace. But an angel befriended them and they were unhurt. "Did we not throw three men bound into the fire? How is it then that I see four men loose walking in the furnace; and the fourth man looks as though he were a son of the gods?" And the nobles who stood by could scarcely speak, so great was their surprise. "It is true, O king," at last they said to Nebuchadnezzar, "that we cast these men into the flames, expecting them to be burned up; and we cannot understand how it happens that they have not been destroyed." "Shadrach, Meshach, and Abednego, ye who serve the Most High God, come out of the fire, and come to me." They came out and stood before the king, in the sight of all the princes, and nobles, and rulers; and every one could see that they were alive. 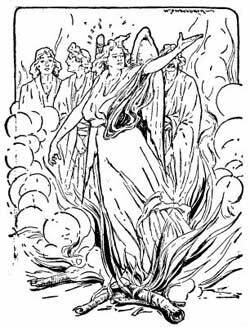 Their garments had not been scorched, nor their hair singed, nor was there even the smell of fire upon them. "Blessed be the God of Shadrach, Meshach, and Abednego, who has sent his angel, and has saved the lives of these men who trusted in him. _I_ make a law that no man in all my kingdoms shall say a word against their God, for there is no other god who can save in this manner those who worship him. And if any man speaks a word against their God, the Most High God, that man shall be cut in pieces, and his house shall be torn down." After King Nebuchadnezzar died, his kingdom became weak, and the city of Babylon was taken by the Medes and Persians, under Cyrus, a great warrior.